This project arose from discussions at the Twentieth-Century Military Sites Working Group for Wales in 2009. Concerns had been raised by members of the group as to the dwindling resource and the need to compile coherent, accurate information to a) assist Welsh heritage managers in providing advice; b) to provide the MoD with a full database of crash sites in Wales to aid decision-making with regard to licensing recovery operations and c) to alert Cadw to crash sites that could be scheduled to afford an extra level of protection. It was hoped that by compiling such a dataset there would also be an opportunity to monitor and protect the identified sites, that can be at risk from a number of factors, including unlicensed recovery operations. The basis for the work undertaken in this project was a database compiled by the RCAHMW. This was examined and augmented with new information, including additional data developed for site classification and management purposes. The additional fields will be incorporated into the Regional HERs in due course and will facilitate site management and will allow the dynamic management of the dataset through the updating of, and addition of new, records. 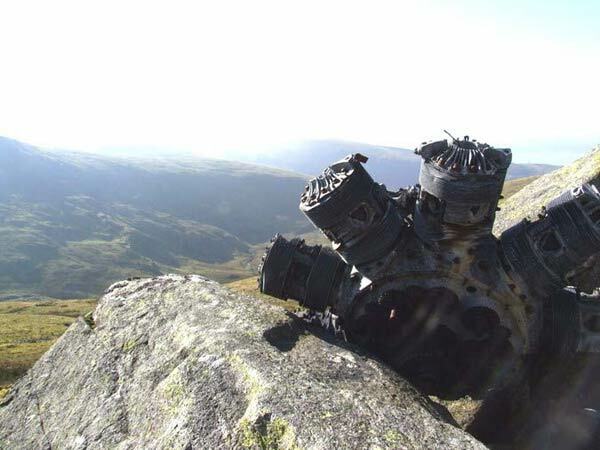 This information will be shared with the MoD and will provide a useful pilot exercise to see how provision of a unified dataset for Wales impacts on their ability to advise on the sites and grant licences to recover crashed military aircraft. The methodology was developed and expanded through the course of the project and will hopefully be taken forward across Wales to provide a definitive source of information, dynamically managed through the Regional HERs and the RCAHMW. A total of 175 crash sites were identified in Gwynedd. Each was assigned a category of importance. Ranging from A (national) to D (a minor or damaged site) with an additional category U, indicating a site requiring further investigation. Twelve sites were found to be of particular significance, however 99 were allocated to the U category: this is an indication of the number of sites that would directly benefit from further desk-based and site-based research. The report contains extensive recommendations for a) future work, b) management and protection of military aircraft crash sites, c) productive working practice and d) principles for military aircraft crash site management.